Body Doubling: The ADHD Tool We Should All Be Using. I was first introduced to the concept of body doubling by Jennie Friedman in her private group Reach Further. It took me a while to figure out exactly how it worked and how to use it in my own private group. Having another person or persons there helps us identify what we are each trying to accomplish. And there is built-in accountability because we can see what each other are doing. Or not doing as the case may be. For those of us with ADHD regular body doubling sessions are a game-changer. First, look for a body double partner or partners who understand how ADHD works and why it is so hard to get things done. Then explain that you would like to work beside them, either virtually or in person. I like to use Zoom conferencing but you could easily use Facetime or some other streaming video. If you are in person all you need is a small space for each of you to work in and get comfortable. There is no need to talk while your work unless you want to. In our group, we often chat at the beginning, and then intermittently throughout our work time. Each person does their own thing. You can ask for advice as needed or chat about the noise in the background of your homes. Since we meet virtually we get a window into the challenges we each face in trying to accomplish our goals. It’s actually really comforting to have another person there even when you are not talking. For me, anything that is not in my Google calendar or my Living Well Planner does not exist. Mostly because I will not remember it if I don’t have the reinforcement of both of those systems. Scheduling body double sessions with my scatterbrained sisters forces me to make it an appointment. After a couple weeks of consistent body double sessions we are in a routine and getting stuff done. There is no point in turning back once you become productive. 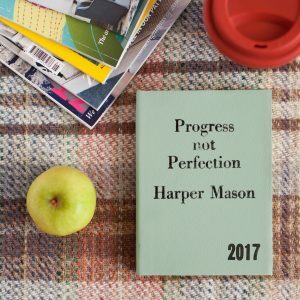 You know how when you sit down to do some unpleasant task….getting started is just so stinkin’ hard? Sometimes it’s hard to get started even on a pleasant task. When we have company we have less trouble getting started. When someone else is there we tend to settle into the activity faster and complete it faster, which leads us to even more productive behaviors. It’s like a Jedi mind trick. When we observe someone working diligently we instinctively want to emulate their behavior. There is some research to back this up involving what are called “mirror neurons.” Some information can be found in this article. Frankly, I couldn’t care less why or how it is happening. I am just glad that my body double friends can motivate me with their presence. And I can do the same for them. Normally when we think about working, we think about doing things we do not want to do. We also picture work as a solitary activity. Even when you work in an office you generally work alone at your desk. Isolation, even for an introvert like me, makes you feel like you are missing out on more fun activities. Feeling like you are obligated to do something makes it less pleasant all around. There is nothing yuckier than saying, “I should….”, right? Body doubling gives me just enough social interaction so I do not feel alone. Though we have different projects and goals, we are all in this together. What’s that expression? Teamwork makes the dream work? Cheesy but true. Picture this: It’s noon on a Saturday and you have been online body doubling for a couple hours. You have completed your meal plan for the week, wiped down your kitchen, and cleaned out your email inbox. Believe it or not you can use body doubling for exercising, studying, organizing…virtually anything. All you need is a partner and a plan. Getting started with body doubling is fairly simple. Sometimes I wonder why it took me so long to try it. I mean, how did I not hear about this until now? Finally, spend some time thinking about the people in your life that would make good accountability and body doubling partners. You want your partners to be supportive and understanding of what you are trying to accomplish. Or join my private coaching group and body double with me! If I could, I would body double all day every day. Body doubling combines accountability with community in a way that seems to work for people with executive function and attention issues. With the right partner/s and some planning you can incorporate multiple sessions of body doubling into your schedule. It’s really exciting to imagine how productive you might be! 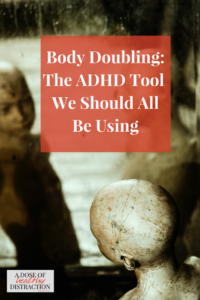 For those of us living, working and parenting with ADHD body doubling truly is a game-changer. Try it and I promise you won’t regret it.